This Monday morning I have here a collection of small vases that I purchased at auction. I am afraid I have been bitten by Cathy's meme of putting something into a vase on Monday. It is great fun to see what everyone puts into their vase. Of course winter can be challenging in this part of the country. Everything outside has been frost bitten so I am featuring one of my air plants in the tallest of this group of black vases. 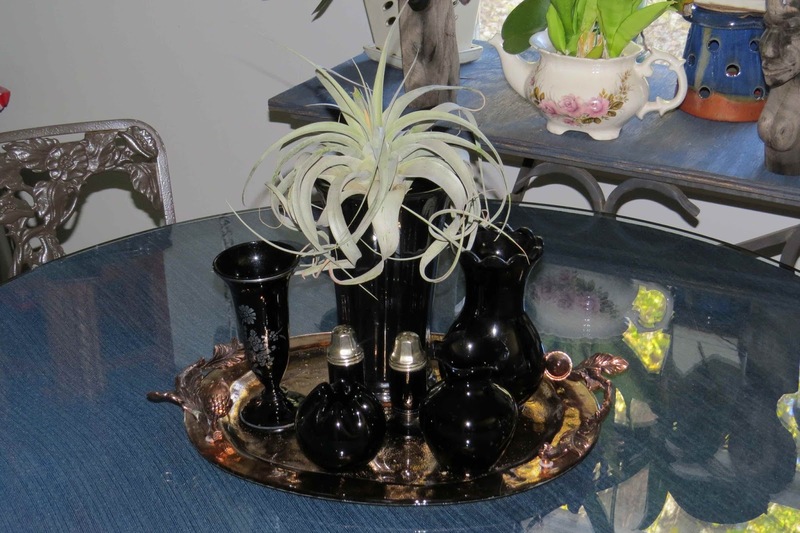 The black vase does show off the air plant. I hope everyone can find a bit of something to show off in their vase today and you share it. 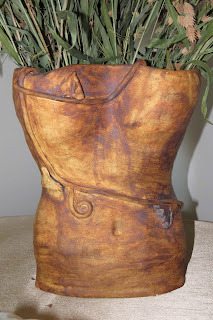 Let Cathy and others know about your vases here. Cathy over at Rambling In the Garden has a meme each Monday regarding filling a vase with something from your garden. I sometimes try to fill a vase but I always follow along because the participants are so enthusiastic about their vases. Thinking about this brought me to the realization that There probably won't be much flower-wise to put into a vase from now until spring. All of this brings me to my contribution to this meme this week. Not only is this not a vase but there are no flowers in it. I can't help myself. 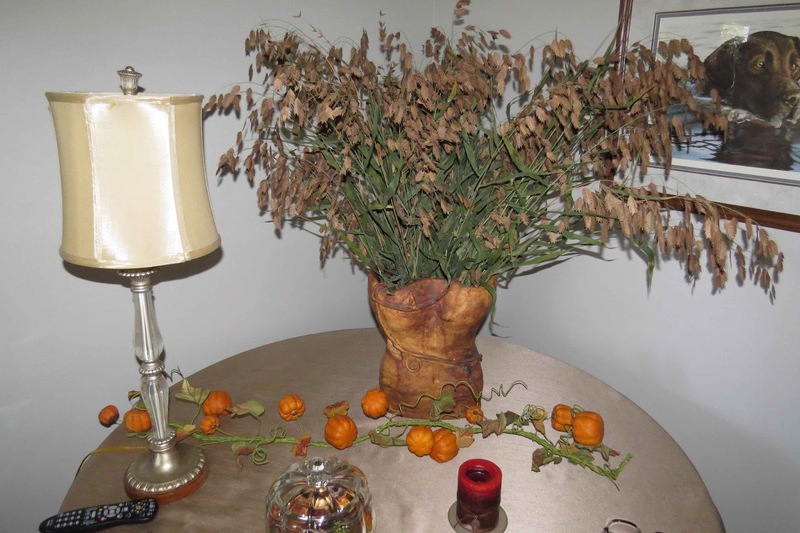 I had this big bunch of Northern Sea Oats seed stems that I cut down so my entire garden doesn't turn to sea oats. I just love the way they rustle and the way they look so I stuffed them into a torso sculpture that I have. I am sure the artist that made this sculpture didn't intend her to be a vase but isn't that kind of like what happens to we women?? We don't always end up doing in life what we originally think we will be doing. It all works out. Happy Vase on Monday to you all. 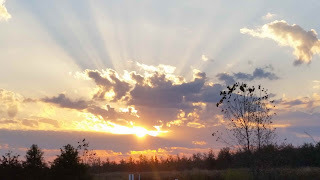 Good Monday morning to you all. While the moon has been the big talk of the morning I on the other hand am sitting here awaiting the sun to burn off the frost and thinking about all the chores I want to do today when it warms. Think 'leaves' here. Frost the past few nights have taken it's toll in the garden as can be expected. We were lucky to have such a long frostless autumn. 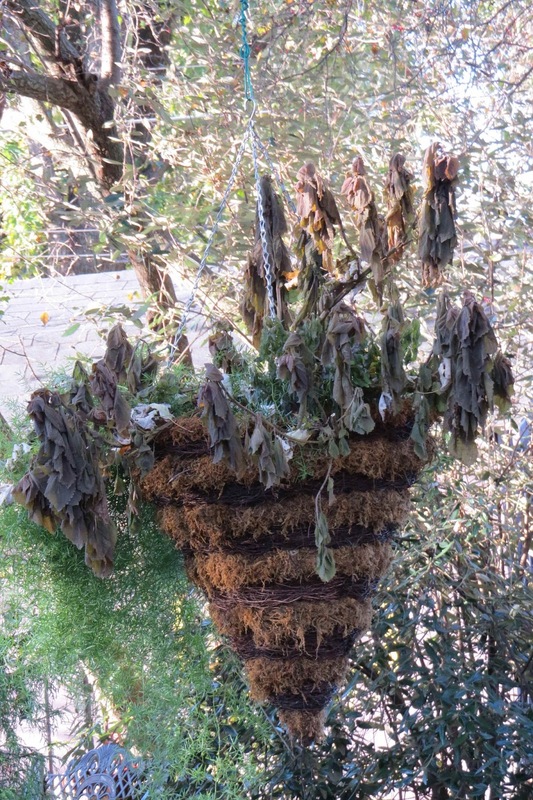 The cone that did so well with the big coleus in it has succumbed. 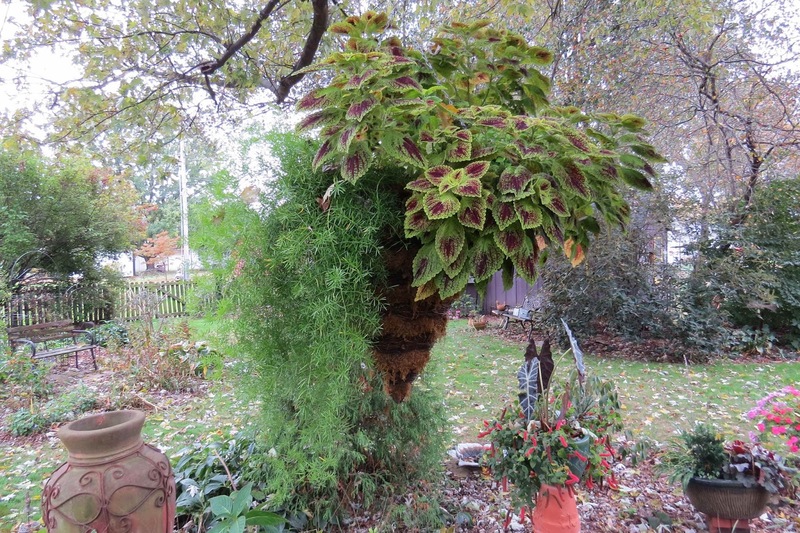 As you can see the frost has put the coleus and other tender annuals down for the season. Even most of the perennials have given up. 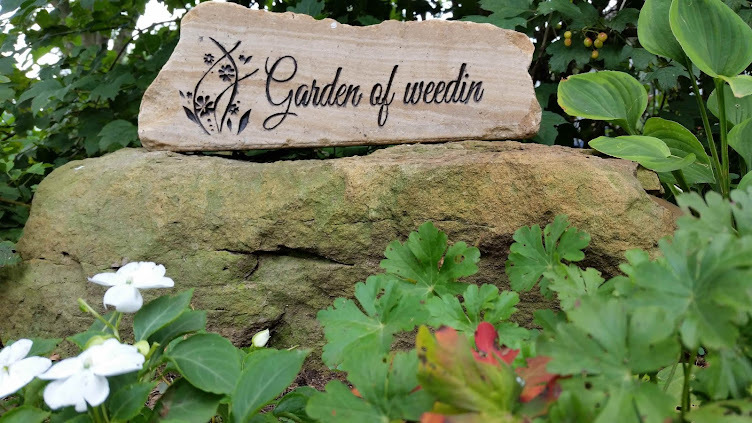 All of which lead to more chores in the garden. 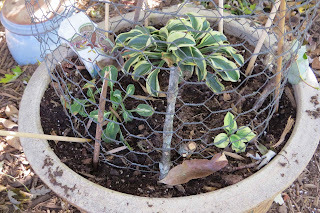 I have already had to put a cage around these potted minature hostas. 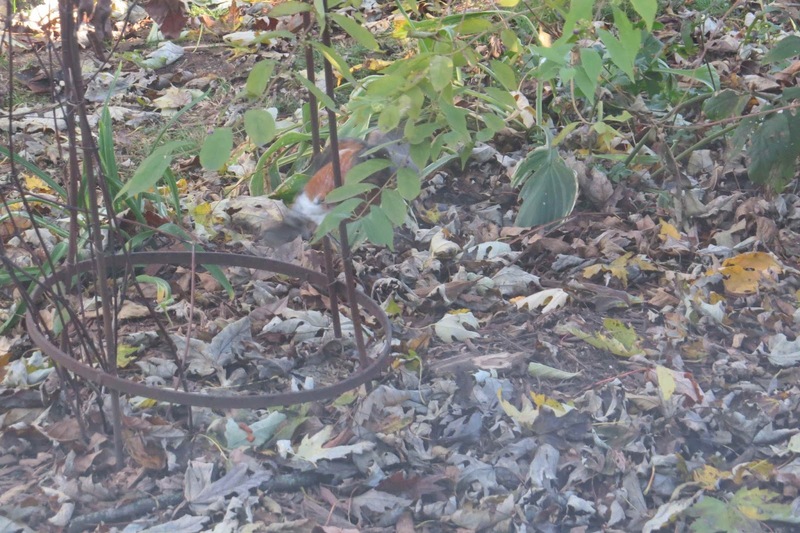 The darned squirrels keep digging them up. I hope they survive. While they are small they are mighty. The two smaller ones would be much larger if the squirrels would stay out of the pot. This isn't the only pot they dig in either. 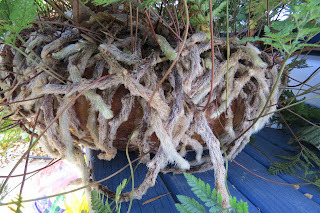 They have pulled out orchids and other plants from their pots. 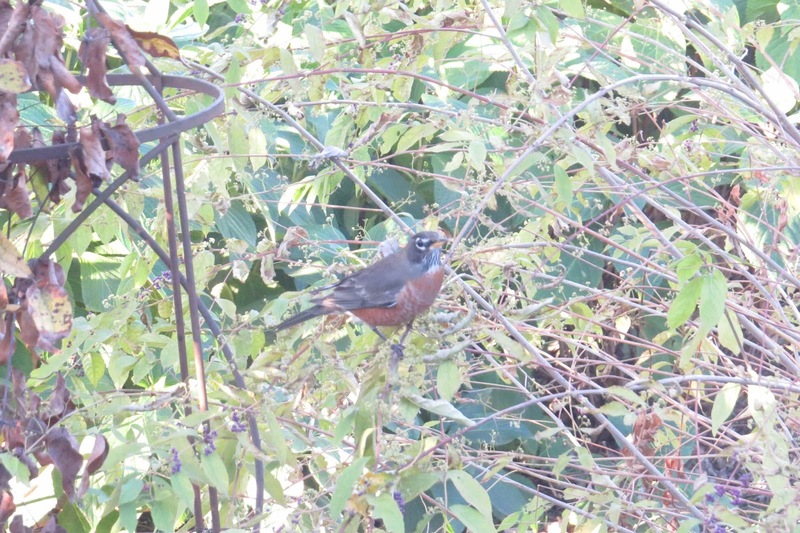 The migrating robins have been in the garden gobbling up all the fruits that are available. They have just about finished off the Beauty Berries. 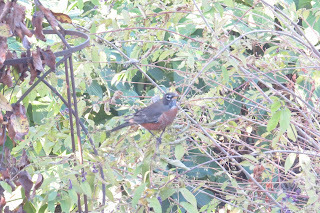 When the only berries left are the ones on the tippy tips of the the shrub they do all sorts of acrobatics to eat them. 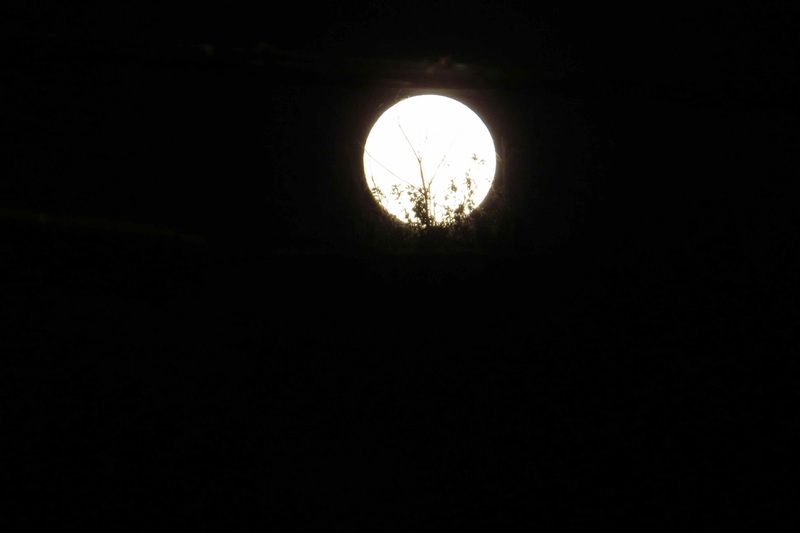 The picture below shows one climbing on the adjacent trellis to get at the ends. It is fun to watch them. It is now more seasonable temperatures even if we haven't had our usual rains. Even the birds of the fields have been coming in to the water feature. 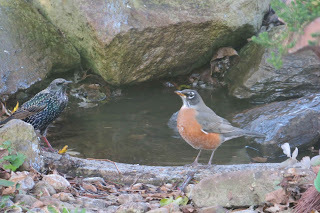 The robins, much to their chagrin, have had to share the water feature with the starlings. 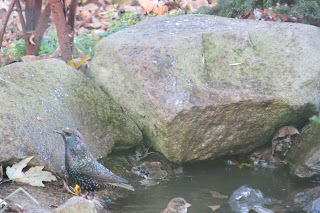 Starlings are so pretty in their winter plummage. They are very skittish so it is difficult to take pictures of them. Sorry about the quality of pictures. 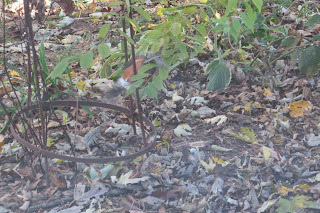 All of the robin and starling pictures are taken through one or two panes of glass. One last bird photo. 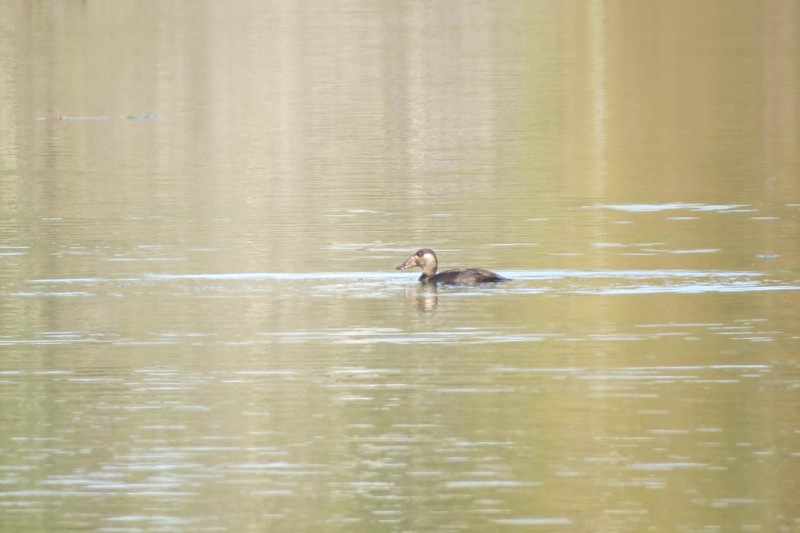 As we were out birding last week we saw a juvenile Surf Scoter in a pond. 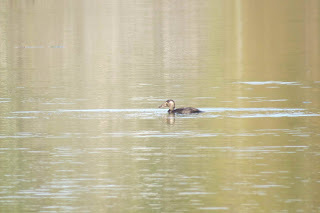 Surf Scoters are sea ducks. I live in the middles of the country 100's of miles from the ocean or the Great Lakes. 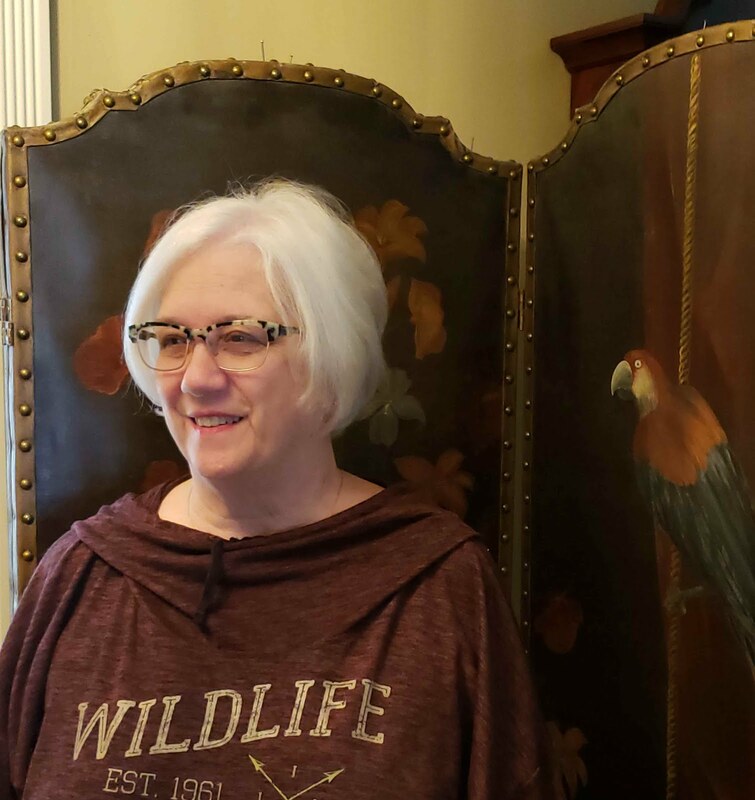 It was such an unusual sighting I thought I would share it with you. If you click on the photo it will get larger so you can see the unusual shape of the bill. I hope all is going well in your neck of the woods. Have you seen anything unusual in your area lately? Are you about to drown in leaves? 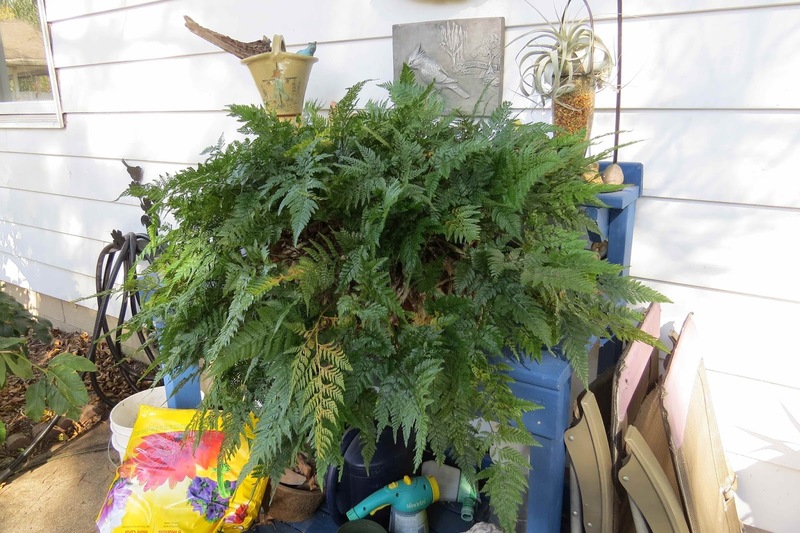 My Rabbit's Foot Fern was huge. I brought it in about 2 weeks ago with all the other house plants. I knew it was heavy because the thing is so big but I didn't realize that I couldn't safely lift it in and out of the tub when wet. So I decided while it is still warm (84F) I would break it apart and make a smaller piece to bring inside. 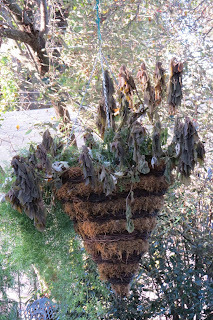 I really hated to break up this gorgeous plant. 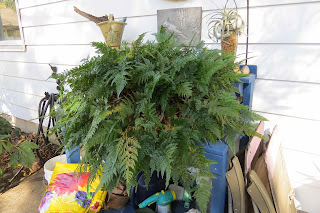 It has been in this short wide pot for years. The pot itself is perfect for the plant as the roots don't go deep. 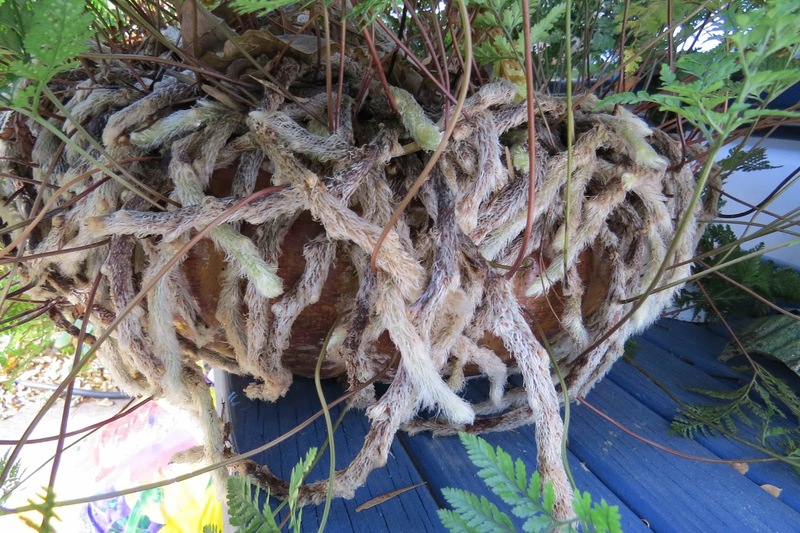 The sweet 'rabbit's feet' that cling to the pot as it grows and matures didn't want to let go. I had to have my DB help me worry it out of the pot. It is times like this that I wish I had a green house to over winter my favorite plants . I took a big chunk back into the house and made four small pots full to give to others. My neighbor accepted a pot. She sent her Granddaughter over to pick it up. She is 7 years old, she said she thought it looked like a "spider in a pot". ha... It must have been her Halloween hangover talking. I still had a big hunk I had to put into the compost pile. 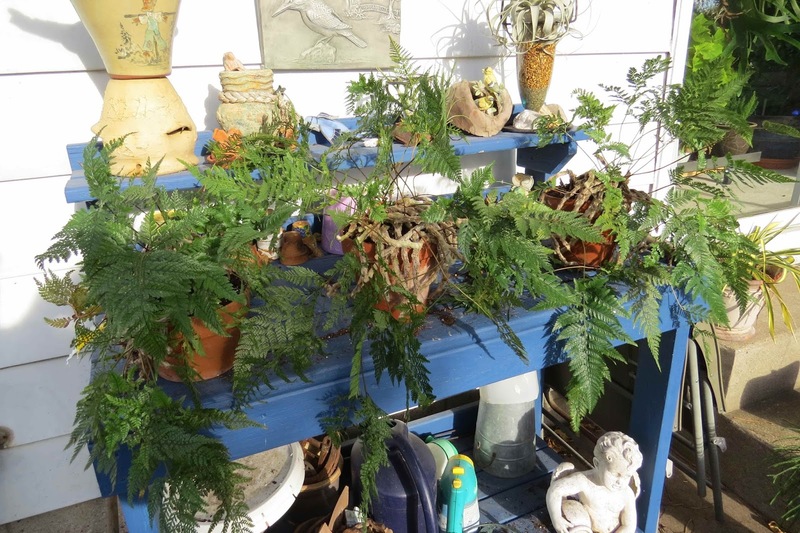 Have you had to downsize any of your plants before bringing them in for the winter?